Tonight marked Campfire Collective’s workshop debut, presenting Storytelling 101 in the gallery at Newtown Library. Whether you were there, or you weren’t, here’s some of the stuff we covered. And then years later a present Dr. Gazzaniga explaining the theory of The Interpreter – the brain function that seeks stories to explain our own actions. The end of the story. You heard the beginning of this story which started at the end, now hear the rest. Listen to what happened after the men with the guns burst in on Johnny Marigliano. After tonight our follow up intensive Storytelling 102 is already full, but don’t worry all you aspiring storytellers, we’re already planning an overflow session in the first few weeks of June, and a showcase event in August to bring all the stories to a stage. So start mining for memories right now! 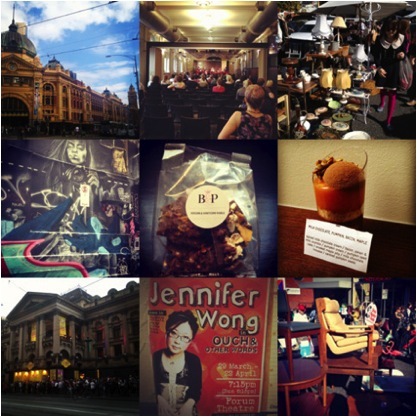 We headed down to Melbourne over the weekend for the Comedy Festival and managed to fit in some eating and shopping around the laughs. We had been wanting to visit Burch and Purchese in South Yarra after we read about it on Lee Tran Lam’s blog and it did not disappoint. We bought up big with a milk chocolate, pumpkin, bacon and maple cake, honeycomb and popcorn rubble, signature Gold Bullion Bars ( salted caramel encased in dark spanish chocolate dusted with gold) and Never Say Never Again biscuits – flavoured with muscavado sugar, coconut, shaved white chocolate and orange. The cake was a perfect match of sweet and savory, like bacon and maple syrup pancakes on top of a spiced pumpkin pie, the honeycomb and popcorn rubble was another winning match of sweet and salty, the Bullion Bars were a little too sweet for my liking and the biscuits were incredibly moreish. I needed a little sit down after all that sugar so we headed over to the Wheeler Centre for the Melbourne Comedy Festival Jeez Louise: Funny Women’s Business forum with Kevin Whyte, the Managing Director of Token Entertainment, MaryAnne Carroll, Executive Producer of Comedy at Network 7, comedy veteran Judith Lucy and comedy newcomer Anne Edmonds. The session focused on agents and representation – What do they do? Why get one? How to get one? Do you need one? Will having an agent change everything? We did some live tweeting if you want to check out some of the discussion. Saturday night we caught four shows between us, Zoe Coombs Marr in Gone Off, Jennifer Wong in Ouch and Other Words, Christophe Davidson in The Time of Your Life and UK guest Simon Munnery in Hats Off to the 101ers and other material. They were all great shows so try catch them in the festival. Sunday morning was bright and sunny so we took off early out to Camberwell Markets for some bargain hunting. The markets are awesome! We picked up some great brass pieces and lamented that we couldn’t take home some of the great mid century and industrial furniture pieces. Camberwell Markets are on every Sunday and well worth the 25min train ride from the CBD. The RAW Comedy National final was on Sunday afternoon and Michael was one of the judges along with Susan Provan the Director of Melbourne Comedy Festival, Todd Abbott who had an afternoon off his role as producer on Josh Thomas’ new TV sitcom, comedy expert Steve Bennett from UK website Chortle, comedian Dave Callan, and Steve Lock from London’s Soho Theatre. We try to catch the RAW final every year and this year it was a really strong group of aspiring comedians from across Australia. Character based comedy was the popular this year with no musical comedy to be seen. The winners Lessons with Luis were hilarious. They’ve got a full length show on in the festival and I would have really liked to check it out. Their videos are here. We ducked into the Hi-Fi for Sunday night Haus Party hosted by our favourites Die Roten Punkte and caught New Zealand duo Theatre Beating and Dr Brown. All in all a fun weekend. Bring on Sydney Comedy Festival. Tonight cultural through-cutter The Standard launch Sydney’s go-to monthly alternative comedy showcase Never Not Funny. Answering the call for an alternative to the mainstream comedy club scene, Sydney arts producers Campfire Collective have teamed up with the all-purpose performance arts space to flex its funny bone and launch a comedy program of laughs like nowhere else in Sydney, at the economically suicidal price of just $15. Never Not Funny is a massive mash up of stand up, sketch, music, theatre, performance art and everything in between. The opening showcase tonight features a hit list of stand up, storytellers, writers and theatre makers including Applespiel (as seen at Festival of Dangerous Ideas), Cameron Knight (Comedy Channel), Dave Jory (Triple J), Ben Ellwood (Triple J), Nick Capper, Ben Jenkins (Director, National Young Writers Festival), musical comedy from Genevieve Fricker, and TV’s James Kerley drops in. Hi, we’ve been a bit absent around here lately, sorry about that. We worked on some festivals, went to New York and saw some shows then went to Palm Springs and chilled out in the desert and now we are back. First up for Campfire Collective in 2012 is our comedy partnership with The Standard. We are going to be working with the good folks at The Standard to bring you a monthly alternative comedy program. We’ve got some exciting artists in the works so watch this space for announcements. 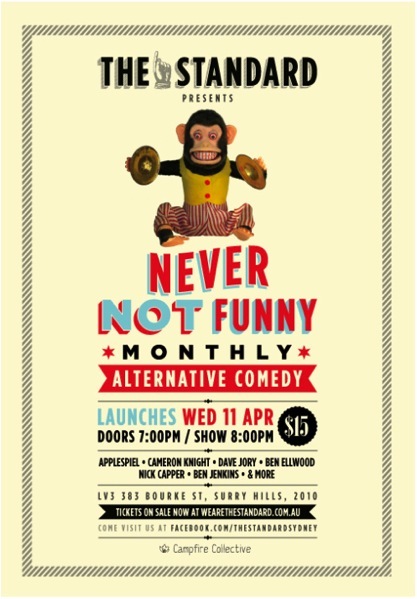 The night kicks off on Wed April 11th at 8pm with Never Not Funny. On the subject of alternative comedy, we just wanted to give a shout out to our friends Cab Sav who are running a monthly comedy and performance night Club Cab Sav at GoodGod. Those guys put on great stuff so we highly recommend getting yourselves there. Stay tuned for more details about our upcoming Storytelling workshops at Newtown Library. Oh we are also getting a new website and thats pretty exciting. * Update – Jimmy doesn’t mind. Just in case y’all were worried. We were lucky enough to see The Moth GrandSLAM XXIV: Fight or Flight when we were in New York recently. We have been longtime fans of The Moth podcast which we discovered a few years ago after starting our own Storytelling event in Sydney. The night was hosted by Dan Kennedy whom many of you will know from the podcast and featured ten storytellers. The storytellers Alethea Black, Micaela Blei, Caitlin Brodnik, Jerald Hayes, Jen Lee, Justin McElwee, Ben Moskowitz, Steven Puente, Michael Soviero and Steve Zimmer. They had all won a previous StorySLAM to make it to the GrandSLAM. We were really impressed with all the storytellers. It made waiting outside for 90minutes in the freezing cold to get a last minute standing ticket worthwhile.